Known as the "King" of spices, black pepper (Piper nigrum L.) and the "Queen" of spices, cardamom (Elettaria cardamomum M.), both perennial crops of the tropics, are the most important and most widely sought after spice crops of the world. They both have many uses, for example, both are used as flavourings and as a medicine. 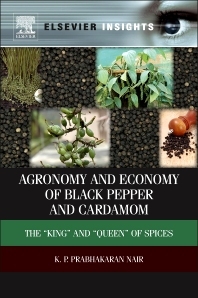 This book provides a comprehensive review of these two very important spice crops, covering origin, history, geographical distribution, production, economy and their uses.